The implementation of hand-held ion mobility spectrometers (IMS) requires the development and evaluation of miniature drift cells providing high sensitivity while maintaining reasonable resolution. 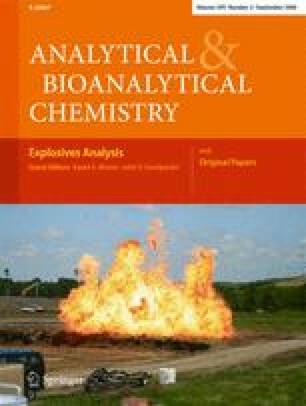 This manuscript describes the construction of a miniature IMS designed for such an application and its characterization by evaluation of the detection limits and resolution of the system with seven explosive compounds including trinitrotoluene (TNT), cyclotrimethylenetrinitramine (RDX), pentaerythritol tetranitrate (PETN), 2,4,6-trinitrophenyl-N-methylnitramine (Tetryl), nitroglycerin (NG), 2,4-dinitrotoluene (2,4 DNT), and 2,6-dinitrotoluene (2,6 DNT). The authors would like to acknowledge Gene Atlas and Kim Johnson of Imager Laboratories for turning concepts into functional devices, and the Department of Energy, Subcontracts A0334-30141 and A0344677767, for support of this work. Sandia is a multiprogram laboratory operated by Sandia Corporation, a Lockheed Martin Company, for the United States Department of Energy's National Nuclear Security Administration under contract DE-AC04-94AL85000.